First off, let’s discuss my relationship with AP. They are my site sponsor and have been so for a several years. I actually approached them after buying the M4E1 because I was so impressed with the product that I wanted to see if they were interested in an advertising relationship. I felt that the M4E1 was something special… and several years later I still feel that way. It’s an awesome piece of kit! Fast forward to last week. Aero sent out their Atlas S-One builder’s kit which consists of the M4E1 Threaded Upper*, M4E1 Lower, and Atlas S-One rail. As soon as the receiver came to my FFL I was out the door with the intent to build. *The threaded M4E1 upper is a seperate item from the M4E1 BAR handguard system. The M4E1 Threaded assembly accepts standard AR components. The Finished Overhaul. No need for a before picture… It’s not worth your time. The upper receiver arrived assembled. The forward assist is held in place by a threaded pin instead of a traditional roll pin. It has evidence of thread locker present from the factory. The receiver is machined with angular stylings on the outside of the receiver raceway and forward assist. There is a relieve cut into the picatinny rail for weight reduction and a stylized appearance. The receiver is forged 7075 T6 Aluminum. It accepts a standard AR15 barrel nut. The fit between the receiver and barrel extension was tight, requiring a rubber mallet to install the Ballistic Advantage barrel. Very impressed with the piece. Angular styling is present and gives the impression of a custom billet upper… yet the receiver is actually a forged component. The lower receiver arrived stripped. The lower is built for ease of assembly. One of the most difficult assemblies on a standard AR is the bolt catch and roll pin. With the M4E1, the bolt catch is held in place by a threaded pin instead of the traditional roll pin and this simplifies assembly. The receiver has well-defined roll marks. It features a stylized A on the R side of the magazine well, and regulatory roll marks on the L side of the magazine well. It follows the theme of the M4E1 product series with an angular style to corners and raised areas. The magazine well is generously flared. All magazines tested drop free including gen 2 P-Mags. The receiver also features a integrated trigger guard. Present in the rear of the receiver is a nylon tipped set screw system which allows adjusting upper and lower fitment. The rear detent hole is threaded to accept a set-screw thereby trapping the take-down pin assembly in place. This is an optional step, and I omitted it as the set-screw was not included. 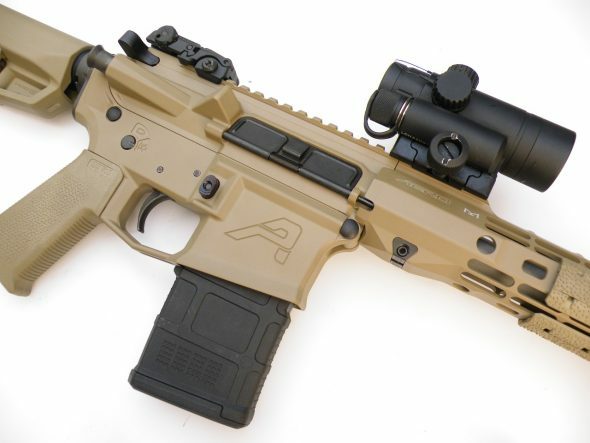 The newest rail system from Aero is a “skinny” rail featuring M-LOK attachment points and three QD swivel slots. The Atlas S-One has an extended picatinny rail forward of the receiver, which then drops down to a angled “roof” at 12 o’clock, and then raises back up for several more picatinny slots at the front of the rail. The rail features M-Lok attachment points and is also available in Key-Mod. The Atlas S-One features a method of attachment to the barrel nut that I have not encountered before. The rail and barrel nut are milled to accept steel wedges that are drifted into place to trap the rail and barrel nut assembly together. Rather than use a punch, the Atlas utilizes a turnbuckle screw to bring the two locking blocks together. The barrel nut must be timed with the position of the gas tube, and slots are milled into the barrel nut to visually help with timing. The barrel nut does not interface with or trap the gas tube. Included with the barrel nut are two timing shims which I did not need to use. Gas block choice will be important as the move towards skinnier rails may limit the choice of gas block. I used the Ballastic Advantage gas block and I have one minor quibble: the gas block clearance at the bottom of the rail is tight enough that installing M-Lok accessories below the gas block lifts up on the barrel. That slot can only support rail covers so that’s a bit of a disappointment but not a deal killer in my opinion. As with all skinny rails, choose the smallest gas block you can. The weight of the barrel nut and rail assembly are 13.6 oz. Once the barrel nut is timed and torqued to spec, the rail is slid in place over the barrel, gas tube, and gas block. The two steel wedges are then installed into the turnbuckle screw and tightened into place. The assembly is now locked together. The included barrel nut and wrench won’t strip any teeth unless your arm is powered by Diesel. Of note is that the rail encapsulates the front of the receiver more so than any other rail I have recently installed. Most rails are flush with the receiver, where as the Atlas S-One extends over the front of the receiver. It features four points of anti-rotation. The anti-rotation “tabs” are quite substantial compared to other manufacturers I have encountered. Many rail manufacturers use two anti-rotation tabs which are small in comparison to those found on the Atlas S-One. I do not foresee any broken anti-rotation tabs as they are beyond robust. They are more akin to anti-rotation “wings” rather than minuscule tabs. The Atlas S-One extends on to the upper receiver and has four points of anti-rotation. I used several components from my prior carbine. I used a Ballistic Advantage barrel and VG6 Epsilon compensator. I used a USGI charging handle. USGI lower parts kit. Used buffer assembly with H2 buffer. Magpul furniture and rail covers were used exclusively. A DI Optical RV2 mounted to the forward portion of the rail rounds out the build. Of note, several forum members are concerned about the red dot’s placement on the rail. Since I will be testing this product, I will check the performance of the red dot on this portion of the rail. I will note any shifts in zero or problems. The build went together easily. The bolt catch assembly was particularly easy compared to past builds. I used blue thread-locker on the bolt catch pin. There were no assembly issues whatsoever. Total curb weight of the rifle was 6.58 lbs: this includes the weight of the Magpul BUIS set, and Magpul Type 2 rail covers. This weight omits the forward grip, magazine, and red dot sight. A standard M16 bolt carrier was used in this build. The builder’s set retails from $292.73 for the 7 inch set, to $409.47 for the Cerakoted 15 inch rail. The 15 inch anodized builder’s set retails for $346.47. Visit the product page here. I hope you can visualize from the photos that the Aero Precision Builder’s set can compete with anything on the market for fit, finish, and build quality. Aero Precision has put a lot of work into this assembly… Builder’s sets are becoming a popular item, but Aero seems to have really pushed forward with components that are thoughtfully engineered and damn good-looking to boot. I want to give them a shout out for breathing new life into the heap of parts that was my carbine! Stay tuned for a range report!